I made a shower curtain. Do you ever find that when you look in your closet, it’s just rows of the same stuff? In my closet, I probably have twenty dresses, fifteen skirts, but only four pairs of pants. Only two of which actually get worn, but that’s beside the point. Despite this obvious pants deficit, every time I go shopping I find myself with an armful of dresses when I head to the dressing room. The same phenomenon applies to my crafting. I have a pile of scarves, yet my hands are perpetually freezing because I only have one pair of gloves. Still, I keep knitting scarves. I have yet to determine if it’s certain types of patterns I’m drawn to or if it’s the end product itself. I suspect the real common denominator is the flash-factor. Even if patterned or neon, pants just seem infinitely more utilitarian than a flouncy dress. Am I right or am I right? Despite my love of the fun and fancy, sometimes I try to be a responsible grown up and sew more practical things. 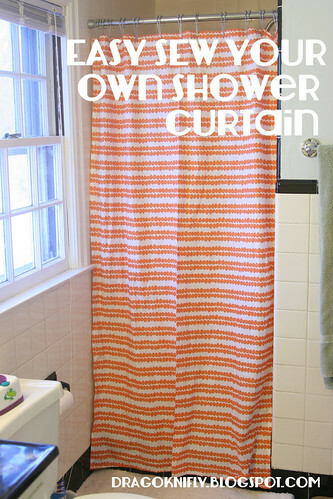 And a few weeks back, I sewed the most utilitarian thing of all: a shower curtain. Now that you know about my little (lack of) pants secret, you shouldn’t be surprised that my shower curtain has been in use for over a decade now. Twelve years to be exact. We bought the $26 beauty (a splurge we hemmed and hawed about, but eventually pulled the trigger on because it had EMBROIDERED DRAGONFLIES, which to 2002 Kelly was a little slice of heaven that needed to be plucked from the Fenway Bed Bath and Beyond). Fast forward to current times and that same shower curtain has been through three apartments, two states, and one house. But shower curtains aren’t handbags or box bags or quilts or dresses or one of the things I like to sew, so it continued its slow death into a graying water-stained oblivion (gross). So, I made a shower curtain. And it took me no time at all and now I’m wondering why it’s taken so long. Literally, it took me longer to think about making it than to actually sit down and sew four edges. 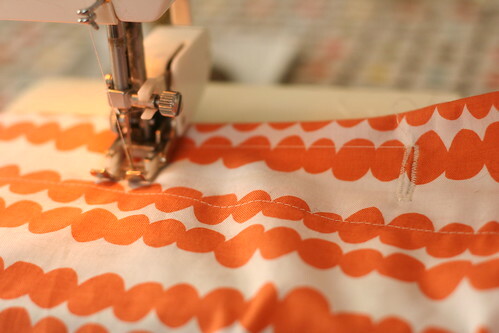 I’ve since sewed pillow cases for our bed and am starting to eye all sorts of seemingly mundane things in our house desperately in need of a sew-y makeover. I’m thinking reusable paper towels are next. 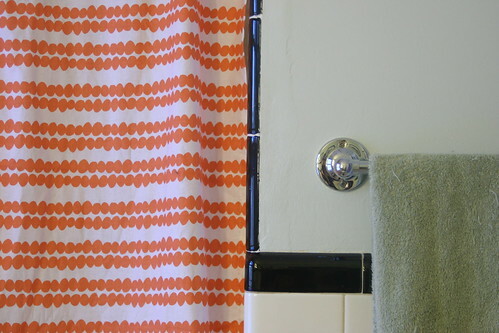 I ordered a couple yards (Note: we have a standing stall shower, for a full sized, you’ll need double the fabric and will need to seam together first) of a pretty awesome fabric that would add a nice pop of color to our black and white tiled bathroom with pale blue walls. I’m drawn to the complementary colors, you see. Fold and press one long side down one half inch, then another half inch. Seam. Repeat on the other long side. Fold and press one short side down one half inch, then another four or five inches. Seam. Seam a second line right next to the first for added fancy. Hold against old shower curtain to determine length. Add an additional three inches and cut. Fold and press last raw edge down one half inch, then another inch. Seam. Hang on button holes. Enjoy!